This product is the core part of belt conveyor, tube is made of casting powder as the mian material, and it is made at high temperature. 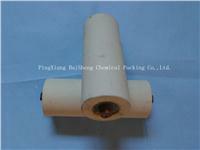 The ceramic drag roller has the advantage of high density , high hardness, high wear resistance, acid and alkali resistence, anticorrosion, waterproof, theftproof, long working life etc. It plays important role for enterprise such as lasting equipment life, improving productive efficiency and reducing product cost. It can be widely used in steel, coking, metallurgy, chemical, thermal ppower plant industries.